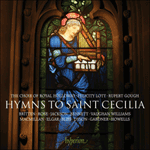 James MacMillan's Cecilia Virgo was commissioned by the Choir of Royal Holloway. The Latin text dates from the 1500s and MacMillan chose ‘to draw on the heritage of richly contrapuntal music from the sixteenth century’. 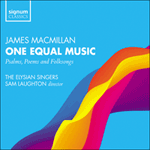 The work is scored for double choir, allowing the composer to make full use of ‘the multiplication of voice parts, as well as the antiphonal duality of the split choir’. This arresting call to Cecilia is heightened by the use of the opposing keys of C major and D major, and it is interesting to compare this use of bitonality with Elgar’s There is sweet music, written over a hundred years earlier. Unlike Elgar’s piece, here the keys are held directly in opposition and yet the effect is both radiant and mesmerizing, and gives a sense of the all-embracing nature of God’s mercy.